These words run across your heart. When Alvina Bokhari was growing up, especially in high school, when the misery of many determines the next few years or decades, she felt like an outcast. Now, a lot of Bokhari’s friends are brown girls—desi, Black, Latina girls. Bokhari says they relate as brown-skinned girls. “We can always go back to that,” she said. Bokhari’s story is a common one. In high school, I remember my best friend nudging me towards Van Morrison’s “Brown Eyed Girl” but I never quite appropriated the song in the same way other brown-eyed girls did. Because even then, I didn’t see my brown skin in the song. I knew, for some reason, that song wasn’t for girls who looked like me. Bokhari latched on to another song, one that better fits what I needed at that time: “Brown Skin Girl” by Leon Bridges. It’s groovy and classic, like the t-shirts Bokhari knew she had to create after she discovered the tune. “The song made me feel like a beautiful, brown-skinned girl. I was like, you know what, I’m gonna make this t-shirt!” she said. She made her first couple of shirts in May. But she didn’t advertise, post, or share it anywhere. After traveling around the world with her best friend, Bokhari noticed people’s elation at the simple message she wore on her chest: “Brown Skin Girl.” That’s when she knew she should start selling it. The product took off and young women started tagging Bokhari in their photos, wearing the shirt. They thanked her for making them feel beautiful and confident. 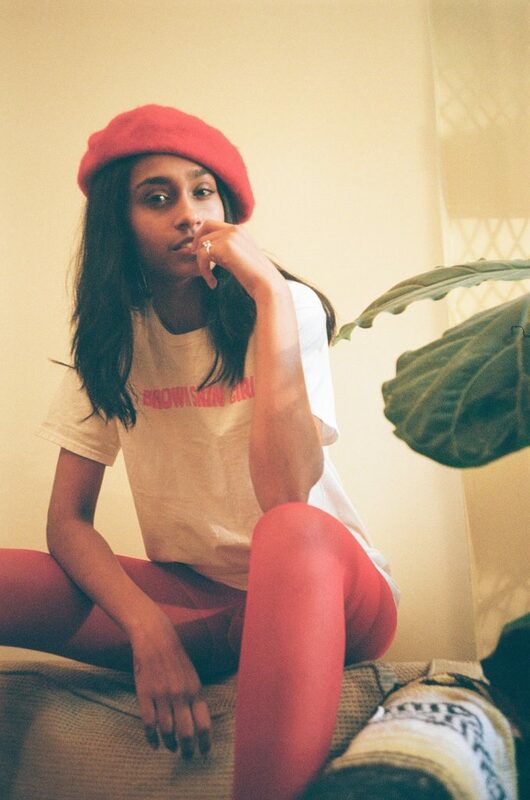 While the t-shirt started out as a self-care project, Bokhari says that’s exactly what the shirt is for—empowerment, ownership, witnessing, showing up, and living proudly in our brown skin. To the girls who thank her, Bokhari shares an uplifting sentiment that reflects the power of her own soul. “I’m not making you feel beautiful. You just are beautiful. You shouldn’t thank me for that…just rep’ it and be happy. Be proud of yourself,” she said. Kajal is excited to add the “Brown Skin T-Shirt” to our online store.